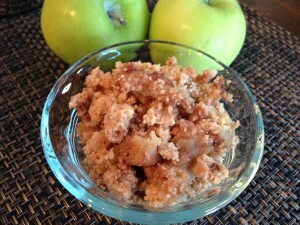 Apple Crumble | Whole Food. Real Food. Good Food. I made this apple crumble the other night for dessert and it was a hit! My son tasted it and the first word out of his mouth was, “wow!” The recipe comes from comes from The 21-Day Sugar Detox by Diane Sanfilippo. It is super easy to prepare, you essentially peel the apples, mix the crumble topping ingredients in a bowl, assemble, throw in the oven and it is done. It is such a simple treat without being too sweet. It pairs beautifully with a warm cup of tea :). Make the topping: In a separate bowl, mix together the almond flour, butter or coconut oil, cinnamon, and salt until completely incorporated. 2. Make the filling: In a mixing bowl, toss the apples with the lemon juice and cinnamon. 3. Make the topping: In a separate bowl, mix together the almond flour, butter or coconut oil, cinnamon, and salt until completely incorporated. 4. Brush the bottom and sides of a 9 by 9-inch or similar-sized baking dish with the melted butter or coconut oil. 5. Place the apples in the baking dish and cover evenly with the topping. 6. Bake for 20 minutes covered with foil, then for an additional 25 to 30 minutes uncovered, until the apples are soft and the topping begins to brown on the edges.